The lower left, with no changes to the world or yourself is Status Quo. Lower right, changing yourself but not changing the world, is Navel Gazing. Navel Gazing is not derogatory but about introspection. Changing the world but not yourself is Dear Leader. Dear Leader is the pole-star who amasses a following. 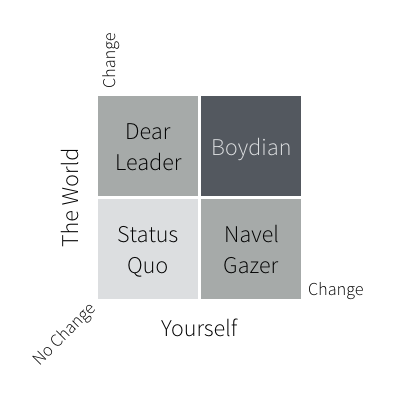 Changing yourself and the world is Boydian because it seems to involve a sort of multi-loop feedback system with changes to the person making changes in the world which make changes in the person. But… this 2×2 doesn’t make any claims about doing things differently or doing different things. And the world only changes in three of the four quadrants. Change only happens for the Boydian, who can do things differently or do different things. The Navel Gazer is trapped in introspection and Dear Leader seems to be reliant on Boydians to actually change the world. I’m far happier with this second try where I’ve tried to make use of all the tropes of Rao’s (in)famous 2x2s. What’s going on here is that the axes are now Doing Things Differently and Doing Different Things and the whole 2×2 is about change in the world. The horizontal axis runs from Freedom (left) to Purpose (right) and the vertical axis runs from Exposed (bottom) to Volatile (top). The whole 2×2 is actually about agency. In the lower left, we’re in The Doldrums, where we have Freedom but are also completely Exposed. We lack agency. We have the whole ocean stretching out in every direction, but no way to act. In the lower right, we’re Hill Climbing. We now have Purpose but we’re still Exposed. This is Doing Things Differently but we’re still stuck with the same Things. Algorithms that implement Hill Climbing search strategies can only find local maxima and might miss potential global maxima, if only they were a little more Volatile. In the upper left we’re on a Random Walk. This concept is response to flaws in the Hill Climbing algorithm and attempts to avoid local maxima by jumping to random places in the search space. 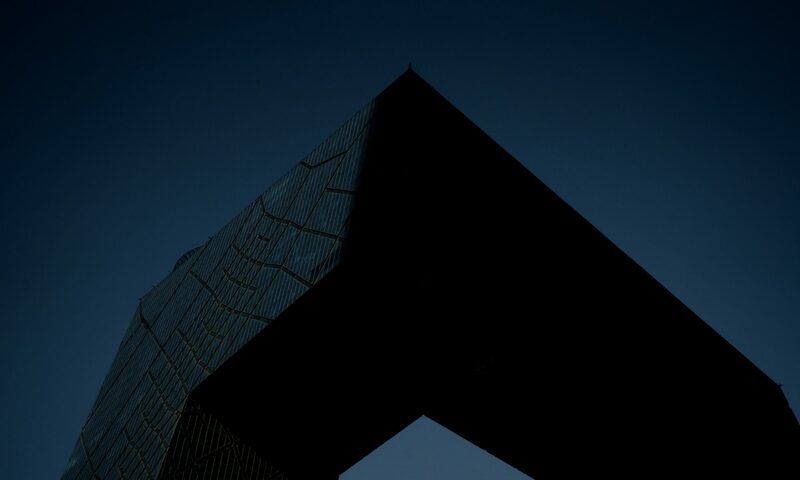 But a Random Walk by itself has no Purpose. On the Random Walk you can Do Different Things, but so what? 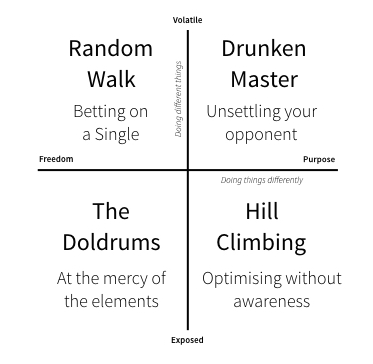 The caption for this quadrant “betting on a Single” is a roulette reference, where a single is one number on the wheel. There’s a big payoff if you’re correct, but if you’re wrong, do you stick to your guns or change your bet? In the upper right is Drunken Master. This is a reference to the zui quan fighting style of Kung Fu most famously displayed in the Jackie Chan classic Drunken Master. Basically, the fighter adopts a drunken affect which unsettles the opponent. There’s (obviously) a strong element to Boydian “getting inside the opponent’s decision cycle” here, too. Previous PostPrevious What are the ethics of “They don’t know I’m the CEO”?